This time switch provides automatic control for 120 volt electric water heaters. It provides to-the-minute accuracy in programming and time-keeping. The time switch can be programmed for repeat daily scheduling, 5-day work week scheduling, weekend scheduling or any individual day scheduling. The timer can be scheduled for operation during the lowest time-of-day rates or to switch off the electric heater during period of utilities peak power usage. The time switch can be set to operate for up to 6 on/off operations daily for a maximum of 42 on/off operations weekly. It provides a convenient external override switch and LED load indicator for ease in scheduling hot water as required for extra hot water demands. 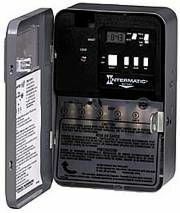 The timer includes a battery carryover which protects both time keeping and program information for a minimum of 3 years. The enclosure is a NEMA 1 lockable steel enclosure which is painted with an electrostatic painting process to eliminate the potential for corrosion. The time switch enclosure provides a 31 cubic inches of wiring space and has a non-removable cover which swings open a full 180 degrees. It offers clear terminal identification on a see-through non-curling terminal insulator. Terminal connections are made using teeter type terminal screws to provide secure connections for wire sizes up to #10 AWG.